June 25, 2010 — A Virgin Atlantic A340-600 Flight VS001 departed London’s Heathrow Airport with 300 passengers and 14 crew members on Tuesday. The flight was to land at Newark International Airport, New Jersey, but due to poor weather conditions the flight was diverted to Bradley International Airport Windsor Locks, Connecticut. Virgin Atlantic Flight VS001 arrived at Bradley International Airport at 8:20 PM. At which time all 300 passengers were not allowed to disembark the aircraft until 1 AM Wednesday morning. Virgin Atlantic had reported that the pilot of Flight VS001 had requested the passengers be allowed to disembark the aircraft. However, accordingly to Virgin Atlantic the pilot was informed that customs did not have the manpower to check passengers and that passengers would not be allowed to disembark and any passenger who left the plane would be arrested. Airport and custom officials denied stating to the pilot that the passengers would be arrested if they disembark. U.S. Customs and Border Protection did not receive a call from the pilot, and no one from the agency refused a request to allow passengers off the plane, said Theodore Woo, an agency spokesman. Woo further went on to say the agency was not informed by Virgin Atlantic until 11 PM. At that time there was only one customs person at the airport and others had to be called in. Without regard for passenger physical and emotional health, Virgin Airlines allowed its passengers on Flight VS001 to sit and wait and wait on their Airbus A340-600 on the tarmac for four hours without air-conditioning with temperatures reaching 100 degrees. Designed as an early generation 747 replacement, the A340-600 flies 380 passengers in a three-class cabin layout (419 in 2 class) over 7,500 nautical miles. It provides similar passenger capacity to a 747 but with 25% more cargo volume, and at lower trip and seat costs. First flight of the A340-600 was made on 23 April 2001. 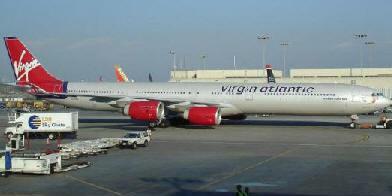 Virgin Atlantic began commercial services in August 2002. When the pilot of Flight VS001 landed at Bradley International Airport the aircraft had enough fuel on board for the pilot to have kept an engine running which would have allowed the air conditioning system to run and provide some comfort to the passengers but the pilot chose not. Did Virgin Atlantic inform the pilot to shut down all engines in an effort to hold down its costs? Virgin Atlantic had reported the airplane’s generators had problems in Heathrow but were fixed and when the aircraft landed at Bradley International Airport the generators went again. Passengers after a while became vocal, shouting, getting aggressive. “It got a little scary. At times, you thought people might get violent” said passenger Luke McNorton. Passengers reported they were offered water, some passengers fainted, there was extra food onboard but it was not offered to the passengers. Did Virgin Atlantic inform its cabin crew not to server the passenger’s food in an effort to hold down its costs? After passengers disembarked the aircraft passengers had to wait 2 hours before they got their luggage and at about 3 AM the passengers were placed on busses and transported to Newark, New Jersey. Does congress need to revisit the new “Tarmac Rule” which only applies to domestic flights and not international flights. Under the Tarmac Rule domestic carriers are required to provide adequate food and potable drinking water for passengers within two hours of the aircraft being delayed on the tarmac and to maintain operable lavatories and, if necessary, provide medical attention. Under the new rule airlines will have to pay $27,500 for each passenger stuck for more than three hours on the tarmac.